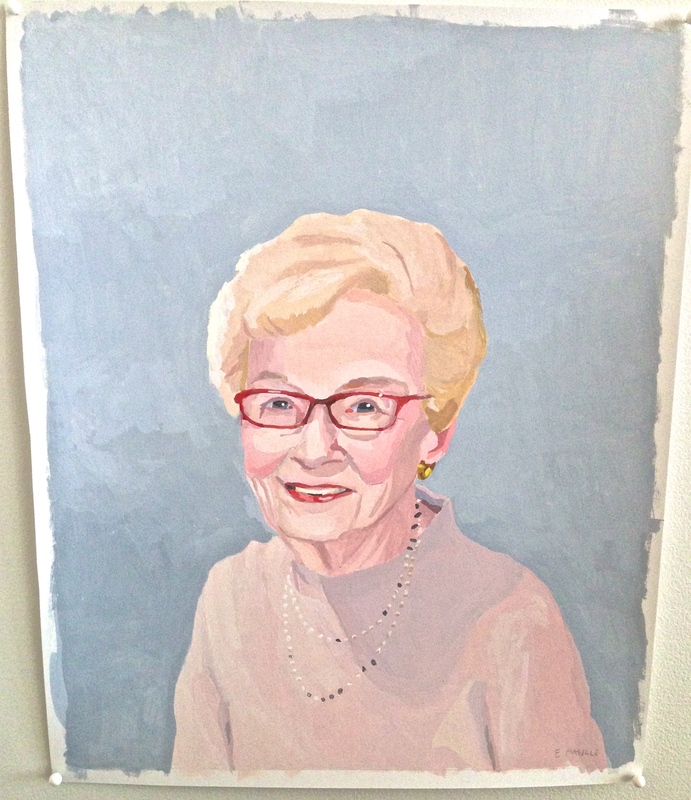 This is a portrait of my Granny Ruth. Ruth was my grandfather Louis’ second wife–the woman he married the year I was born. Ruth was the person who, when I was a young girl and feeling like I had no place in the world, whispered crazy, un-p.c. things to me that, until then, I’d never heard the likes of. She insisted I was her favorite. Not only was I beautiful but I was more beautiful than my sisters. Not only did I have a lovely smile, but I should be so delighted that my mouth didn’t naturally turn down at the corners like so-and-so’s did. And didn’t I notice how perfectly straight my nose was–not rounded on the end like she who I will not name here. This might sound like Gossip-Girl-meets-Flamingo-Kid, but let me be clear: I was the eternally overweight girl with the pajama top tucked into her pajama bottoms. The girl with the headband pushed back and then forward again so there would be the perfectly uncouth bump of hair framing the top of my face like a crooked, broken crown. I was the middle child between two beautiful, thin, athletic, feathered-hair, boyfriend-having, cheerleading, presidents of student government. I needed Ruth’s cutting remarks and bolstering prevarications more than I needed air. We never saw much of Ruth or my grandfather when we were growing up. They married quickly after my grandmother Lucille died and I imagine the feelings of hurt and betrayal were the ones that won out for my father and his sister. But when we did see them, I looked forward to those whispered moments and when we parted ways I would stand just a bit taller and let my freak-flag wave just a little higher. When I had children of my own and my grandfather had passed away, the generation between us no longer held much sway, so Great-Granny-Ruth became an enmeshed part of my children’s lives. She was always an extremely petite woman, but in the later years of her life she was shrinking even faster than my eldest, Jack, was growing. Visit after visit the first thing Jack would do was stand back-to-back with Ruth, eagerly anticipating the day he would be taller than her. A day that came when he was not much older than eight and when the idea of being taller than an adult was almost too much delight to bear. I had this portrait of Ruth painted from one of my favorite photographs about a year after she died in 2010 at the amazing age of 94. It was created by an artist named Elizabeth Mayville who I found on Etsy after falling in love with her totally unexpected gouache portraits of professional basketball players–two of which I immediately grabbed up. I love the idea of a posthumous portrait, perhaps in conjunction with creating a small space for a home shrine, or just as a standalone piece. I’m considering finding a small stable of artists who are similarly interested in the idea and offering their services through the Three-Fourths of an Ounce website. In the meantime, I’m delighted you’ve had a chance to meet Granny Ruth. I miss her and often hear her subversive words of praise whispered to me as I pass her portrait on the wall.